Gain clarity on making important choices in your life so you can feel more confident and stop second-guessing yourself. By centering yourself and asking these specific questions, and listening to your body's natural intuition, you'll be able to allow your divine higher-self guide you toward choices that offer greater possibilities! 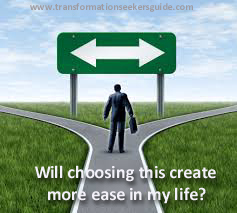 Choice is one of the most important tools available to us, and one of the fastest ways to change your life.... which on one level is just an ongoing series of choices right? So why not work with the universe and ask for the guidance instead of working against it with your judgments and conclusions? How many times have we believed we have only one choice or a choice between one of two sides? And how often do we think we have no choice and even worse... what about when we stress about trying to make the "right" choice which is actually a conclusion. What's available here are questions that you can ask that can lead to a more expansive way of being in the world and creating a life with more joy. Did you know that when you ask a question from a place of wonderment and curiosity instead of making a conclusion from a fixed point of view about something, it energetically opens up the space for a different possibility to show up and reveals a new action you can take? Choice creates awareness and this is our power to generate and create our future. Well, there is an easier way if you are willing to trust the universe and your intuition and learn to sense what's light or heavy in your body. You see, there are also specific questions you can ask when you are faced with a choice or option. For example; moving to a new city, whether or not to make an investment, buying a new home, shopping for a gift, choosing a restaurant to eat in - the big and the small. Here's a helpful way to put an end to the doubts and let your intuition guide you. This guided audio recording offers the ideal questions that will open up the space for more awareness and also bring up the energy of what a particular choice will create in your life and in your future so you can make choices with more ease. 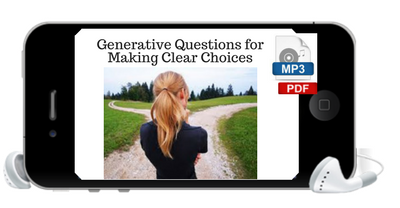 This guided audio contains over 25 specific looped questions designed for you to listen to easily on your mobile device. The more you hear them, the more you'll naturally begin to ask them in everyday situations on your own. A true energetic awareness will come up about whether that particular choice will be contractive and heavy, or expansive and light. This tool gives you a way to use your body's natural internal guidance system to know what the energy of making that choice would be. Did you know that the energy that is present when you make a choice is an indication of the energy of what having that experience will create in your life? This download offers you the best questions you can ask yourself to get a sense of what your awareness and your knowing is so you can stop second-guessing yourself and make choices with confidence. I've also included some helpful generative questions that are designed to allow you to stay out of conclusion and open up space for the true energy to show up instead of going to your mind's conclusions.